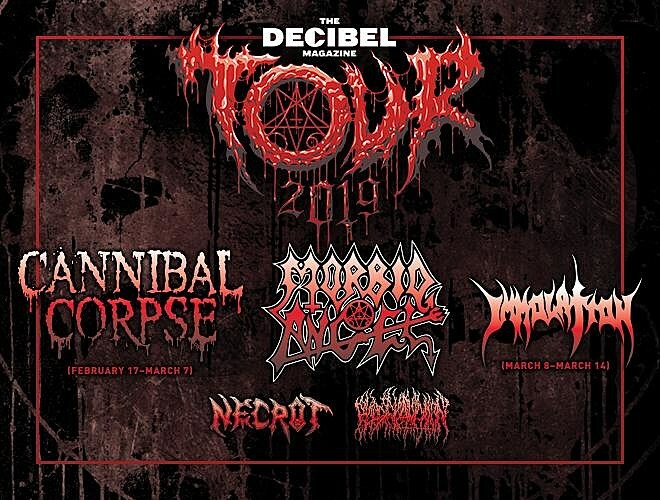 The 2019 Decibel Magazine Tour has been announced, and it’s stacked as usual. Legendary death metal bands Cannibal Corpse and Morbid Angel are co-headlining most dates (which marks their first time touring America together), and support comes from Necrot and Blood Incantation. For the final six dates of the tour, Cannibal Corpse will be replaced by Immolation. The tour includes a NYC show on March 7 at Playstation Theater and that’s the final date of the tour that Cannibal Corpse are on. Tickets for that show (and the whole tour) go on sale Friday (11/16) at 10 AM. There’s also an AmEx presale for that show. All dates are listed below. Speaking of Decibel, the LA edition of Decibel Metal & Beer Fest happens in December with Triptykon (playing Celtic Frost), Testament (playing The New Order and The Gathering), Godflesh, YOB, Power Trip, Pig Destroyer, Khemmis, Necrot, and more; and the Philly edition of Decibel Metal & Beer Fest goes down in April with Baroness, Deafheaven, Obituary (playing Cause of Death), Enslaved (playing Frost), Exhorder, Deceased, Rosetta, Tomb Mold, and more.